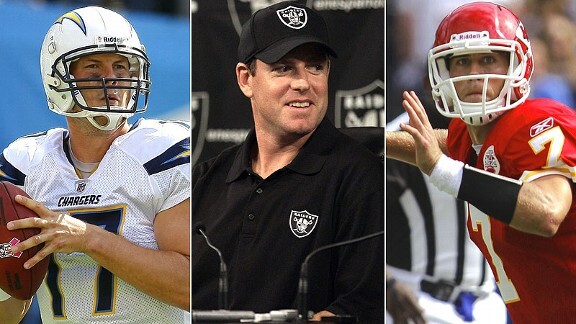 Super Charged Blog: Who's our biggest AFC West threat this year? With Denver getting Peyton Manning and the Chiefs getting back from injury I will discuss who will be our biggest. Although Oakland are a good team I don't think they can be considered to be a main competitor due to there lack of draft picks and their dreadful free agency. The Chiefs should be a much better team than last years 7-9 squad. This is mainly because the likes of Eric Berry and Jamaal Charles will be returning who are some of there best players. As said by many draft analysts there is no real pressing need or gap and so in the draft they could have luxury picks of who they thought had the most potential and pick the best players. They took combine beast Dontari Poe at number 11 and added many other decent guys who can enter there defencive rotation. To be honest the only weakness I can see with Kansas is their quarterback Matt Cassel which is where the chargers should be able to catch up but can Cassel make it happen with this loaded offense? If it weren't for Peyton coming to Denver we would still have Tebow in the AFC West. You might think that this is a bad thing for the chargers but not so fast! The Chargers for some reason are absolutely dominant over Manning and have gone 5-1 against him so far. Although Manning now has a much better defense with him and a decent offense I'm not sure the future hall of famer will be able to make a succesful return after his neck surgery. It's as simple as this in my opinion, if manning plays like he did before his injury then Denver win the AFC West, if he doesn't Denver will be beaten by both chargers and Chiefs for the title. And dont forget Tebow lead the Broncos to a strong win over the Chargers last year and came on in the second half losing by a mile and almost pulled the game back for the Broncos. All in all a healthy Chiefs side is likely going to be the toughest team for the Chargers with the Broncos close behind them. Although you can never rule the Raiders out the seem to be the weakest team at the moment.